Americans have a great vision of what a real space program would look like. Many remember the stunning historic accomplishments during the Apollo days, or the 135 space shuttle missions, or even constructing the space station. President George W. Bush continued that proud tradition by setting America on course back to the Moon and on to Mars. But the last eight years saw a cancellation of all plans for deep space exploration--replaced by rhetoric of a 'journey to Mars,' but missing the plans to get there. The dream seemed betrayed, and expectations of a bright future appeared to dim. President-elect Trump has promised to launch a bold new era in space exploration; to restore NASA to its true mission of space exploration. Coalition Director Art Harman's op-ed in the Washington Times described some of his goals. Mr. Harman prepared the recommendations in this brief paper to assist the transition as it seeks to direct NASA to best achieve the president-elect's goal to make America great again in space. Premise: America must remain the worldwide leader in space exploration and technology. If we retreat; if we ignore global competitors; if we look not at the incredible payoffs to the economy but at the investments required; if we fail to join a race others have already started, then America loses. America loses the investments, jobs, inventions, national pride and international respect. Perhaps forever. Those are the stakes. We don't live in a vacuum, and China is working fast with the intent to surpass the U.S. Their military-led space program is a strategic threat, not merely a competitive threat, and requires bold American leadership to stay in the lead. If China doesn't intend to claim the Moon, Mars or orbital space as theirs, they are setting a poor example in the South China Sea, and space dominated by China would be hostile to commercial space. We lost eight critical years under President Obama, giving China and others a tremendous head start. 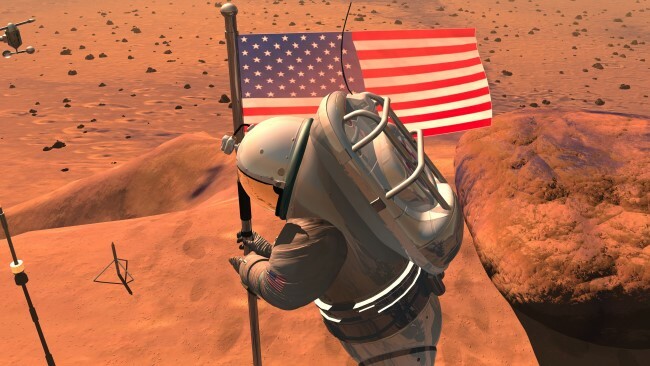 Therefore, America must now lead the way and build a Lunar base and go to Mars, harnessing the best of American innovation and commercial enterprise. The result will be a booming economy, great jobs, more investments, students beating down the doors for STEM studies and careers, and greater national pride and international respect. The following recommendations address key programs and goals to rebuild our space program. Asteroid: NASA must cancel the Asteroid Redirect Mission (ARM). This should be done immediately to avoid wasting further precious NASA resources on this decade-long detour from real space exploration. ARM is hated by NASA engineers, Congress, space experts and space advocates, and it would consume $2 billion for just one single mission of mild interest sometime in the late 2020s--at the same time China is likely to be stunning the world building their Lunar base. Commercial ventures such as Deep Space Industries and Planetary Resources are eager to mine asteroids on their own, but the pending ARM mission might cause investors to wait 10-15 years to see its results before investing. Commercial Crew: NASA should accelerate commercial crew launch readiness to eliminate reliance on single-source crew launches on Soyuz. This is of critical importance following the recent Soyuz/Progress launch failure, and a similar 2011 failure. If ISS must be de-crewed before a Soyuz return to flight, this could be dangerous to its survival; read Art Harman's 2011 paper on possible actions to avoid de-crewing the space station during a launch crisis. NASA should ask Congress for immediate supplemental appropriations. Heavy Lift: NASA should accelerate SLS/Orion readiness and prepare for a minimum of two launches per year to allow real missions to the Moon, Mars and beyond. America used to launch several shuttles per year, and we must not retreat to currently-scheduled exploration launches every few years and only to Lunar orbit. Super-heavy lift SLS is essential for Lunar and Martian exploration, and would be used for large payloads, while Falcon Heavy and New Glenn rockets can be used for smaller payloads. NASA should ask Congress for supplemental appropriations. Mars Flyby: Replace ARM with the 2021 Mars-Venus flyby opportunity. This is a near-term mission to inspire Americans and would accomplish the "Apollo 8" validation for the journey to Mars in preparation for real landings. Costs might not be too much more than ARM. America went to the Moon from scratch in just eight years, so we can certainly do a flyby in four years. Key elements include: Accelerate SLS production and shakedown missions, develop the ECLSS life support for a 600-day mission, and develop the transit habitat. Moon: Declare it is U.S. national space policy to begin construction in the early 2020s of a Lunar research base with ISS partners--and make it happen. NASA would prepare the timelines, hardware and personnel needs, and prepare the budget requests to Congress. The current NASA Administrator proclaimed, "America will never lead a mission to the Moon in my lifetime, in spite of our ISS partners begging us to do so." NASA shuttle astronaut Leonard Chiao, who served on the Augustine Commission was instructed that the Moon was off-limits for the Commission's findings: "the moon was perceived as President [George W.] Bush’s program, so I don’t think that was really a starter, politically." It is now time to cancel the apparently partisan opposition to exploring the Moon and invite our ISS partners to help us build a Lunar base. Mars: Declare it is U.S. national space policy to achieve the first crewed landing on Mars in the early or mid 2030s--and make it happen. NASA should begin to prepare the timelines, hardware and personnel needs, and prepare the budget requests to Congress. The current administration has stated NASA is on a "journey to Mars," however there are no concrete plans or budget requests--it's just rhetoric and hashtags. Embarking on a 1,000 day Mars mission without first learning how to live on another world on the Moon unnecessarily risks astronauts' lives. The Moon is three days to home in case of disaster, and all costs and timetables are dramatically less by using the Moon as the training ground for Mars. Buzz Aldrin agrees we must go to the Moon first, saying, (The first astronauts to go to Mars will) "need to go to the Moon orbit and assist in the assembly of modules to be landed while preparing that base on the Moon. They need to go down and stay on the Moon for some time. Now they would know what Mars is going to be like." Lunar Orbital Station: Various proposals are promoting building an ISS-like space station in Lunar orbit. While intriguing, the reality is that very little would be gained from this. Construction could take years and billions of dollars, diverting resources from landing on the Moon and building a research base that would be truly valuable. America must avoid spending years merely in Lunar orbit rather than actually landing. The surface of the Moon, not Lunar orbit, is the essential test-bed for learning how to successfully live on the surface of Mars, and the public would support landings far more than they would a decade's detour to Lunar orbit without ever landing on the Moon. China and perhaps ESA will be landing on the Moon, likely in the early to mid 2020s, and the U.S. should not be stuck in Lunar orbit while China is building military and semi-civilian bases and capturing worldwide enthusiasm. It would be financially difficult to pursue both a lunar research base and a lunar-orbit space station. A few 30-day Orion missions with a habitat could accomplish almost as much science as would a lunar orbit station, yet would not delay by a decade landing on the Moon and going to Mars. Commercial Space: The new administration has the opportunity to increase commercial partnerships with NASA. For example, a space act agreement or X-Prize could be awarded for lunar landers and many other critical needs. The National Space Policy Council is likely to work out the right balance between new space, industry and NASA resources for everything from rockets to habitats. NASA and other agencies must avoid over-regulating commercial space ventures, and support property rights in space and useful legislative needs. NASA should continue to share data and technology with U.S. commercial space ventures, such as Space X's planned "red Dragon" unmanned landing on Mars. * Maintain the existing ban on all space cooperation with China, because their military-led space program would plunder our highest technologies for military purposes and unfairly compete with U.S. space industries with stolen tech. * Maintain existing ITAR laws to protect U.S. dual-military-use high technology from being stolen by China and other nations. New International Partners: NASA should continue to advance opportunities for India, South Korea and the United Arab Emirates to become partners on the International Space Station and future space exploration missions. China must not be an ISS partner due to their theft of our highest technologies. * Continue building and launch the 2020 Mars rover, which will collect and store soil samples for later return to Earth. * Begin development soon for the Mars soil sample return (MSR) mission. Human landings cannot safely occur until we have fully tested on Earth all elements of the soil for toxins and perhaps ruled in or out the possibility of indigenous life. The MSR has been the top priority of the Planetary Decadal Survey for many years, and must be launched within a few years or less after the 2020 rover collects samples for return. * All future robotic Mars missions should be focused to support human landings and habitation. No more using launch windows for InSight or MAVEN type pure science missions. Better might be robots that seek and process water or drones that scout human landing sites. * Support the planned mission to Jupiter's moon, Europa. * Consult the Decadal Survey for additional planetary mission priorities for the 2020s and 2030s. * Use SLS or other heavy lift rockets where appropriate to allow larger planetary spacecraft, or to cut years off transit times (which saves time and money). * Increase supplies of plutonium-238 (the power source for Curiosity and outer planet missions) to allow for future long-duration and outer-planet probes. Without plutonium 238 production, outer planetary missions would be impossible. Advanced R&D: Increase research and development via space act agreements and X-Prize-like awards for advanced technologies for human space exploration. This can include kW and mW range plasma engine propulsion--suitable for manned spacecraft, such as Ad Astra's VASIMR, inflatable habitats and space stations such as Bigelow Aerospace's, advanced long-duration life support such as Paragon Space Development Corp's, nuclear reactors for space propulsion and Mars/Lunar bases, such as NASA/DoE's proposal. NASA's Swampworks is the current hub for many technologies essential to live on other worlds, and should receive increased funding in preparation for Lunar and Mars landings. This Term: President George W. Bush set a course back to the moon and then to Mars with the Constellation program. His greatest error was in not funding it sufficiently to get back to the Moon within his two terms. 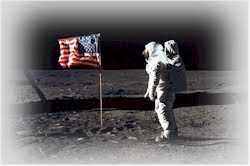 Had he, America would now have a well-established base on the Moon and be preparing for Mars missions. By going slow, he left an unfinished plan that was easy for President Obama to kill. It is therefore essential to 'deliver the goods' within the first and second terms to keep public and Congressional support, so there is so much momentum that another anti-space president like Obama can't shut it down. Because Congress had the foresight to save SLS and Orion and to begin habitat development, real manned missions perhaps including a Lunar landing, are possible within the first term. Within the second term, we can accomplish the Mars-Venus flyby, build a Lunar base, and start to build the components for a Mars landing. Refocus NASA: NASA can be restored to its core mission of space exploration by removing activities which other agencies could better accomplish. For example, 13 other agencies study the climate, and they should take over such activities from NASA. The Goddard Institute for Space Studies should be abolished as it has become a left-wing activist entity which is unconnected with NASA's mission. Read Coalition Director Art Harman's paper on how NASA's mission was diverted from space exploration to climate change. National Space Council: The vice-president should use the National Space Policy Council to determine the best mix of new commercial space, industry and NASA resources to accomplish our national space policy objectives, and to determine the best methods to support private space ventures. The vice president should work with Congress to secure the necessary authorizations and appropriations. One of the intentional faults with the Obama Augustine Commission was in not concluding that space exploration was a serious national priority, and should receive sufficient support. The Council should therefore start with the premise that the U.S. must remain the leader in space exploration and technology, and evaluate its decisions based on that premise. Budget: NASA's budget has declined from about 4% of the Federal budget during Apollo to less than 1/2 of a percent of the budget today. U.S. high tech leadership is essential to our growth and global competitiveness, NASA must be seen not as an expense, but an investment which pays off far more to the economy. To retain our leadership as China and others are setting course to the Moon and beyond, it is vital to increase NASA's budget to accomplish the president-elect's goals. Note: Once the James Webb Telescope is launched, the large development funds should not be cut from subsequent NASA budgets, but kept within NASA for space exploration. A flat or barely-increased NASA budget is a recipe for continued decline, and would pit important NASA missions against each other for survival. Dr. Neil deGrasse Tyson advocates for 1% for space, or roughly doubling the budget. Perhaps a 20% increase each year would be a good start. Like defense, space exploration is a national and strategic priority which must be increased and not cut. Leadership: The old adage is that "personnel is policy" is particularly applicable for NASA or any agency in great need of reform and re-focusing on strategic goals. It is therefore vital to nominate a NASA Administrator and a Deputy who will be most able to effectively restore NASA's deep space exploration mission and to cut bureaucracy. NASA in the Apollo era was entrepreneurial and fast paced, and succeeded in the seemingly impossible: going to the Moon, having to invent everything along the way, and to do it "within this decade." With similar star-high goals and tight deadlines, America can make history again. Address to the Nation: To rekindle public support and enthusiasm, and to build additional support in Congress, President Trump should make a major speech in support of a bold return to space exploration within a few months after Inauguration Day. This will inspire Americans who are weary of watching America retreat, drive students to STEM programs and careers, and send a signal to the space industry that America is returning to bold space leadership. I would recommend a few hints in the inaugural address of things to come. The public strongly supports the space program, and President-elect Donald Trump has the opportunity to re-launch American leadership in space. This agenda outline will help point the way to America's bold future as the leader in space exploration, technology and jobs for the next generation. Thank You and Please Donate for 2017!